Despite a popular modern attitude of disparagement regarding cities, placing the urban at odds with that which is natural, the promotion of the urban is one of my greatest interests. A while back on my and Greg’s former blog, Criticism As Inspiration, I decided to write a short series of posts concerning some of my favourite [non-trespassing] adventures from Los Angeles (beginning with parts of Griffith Park with the intention of becoming more unconventional/climactic as the series progressed). I ultimately aborted the series after the initial post because I realised it wasn’t exactly suitable content for the CAI blog. Even so, one of my most favourite pastimes is ‘urban exploration’ – exploring that which is typically overlooked, ignored and shunned for being banal, strictly functional and ugly. 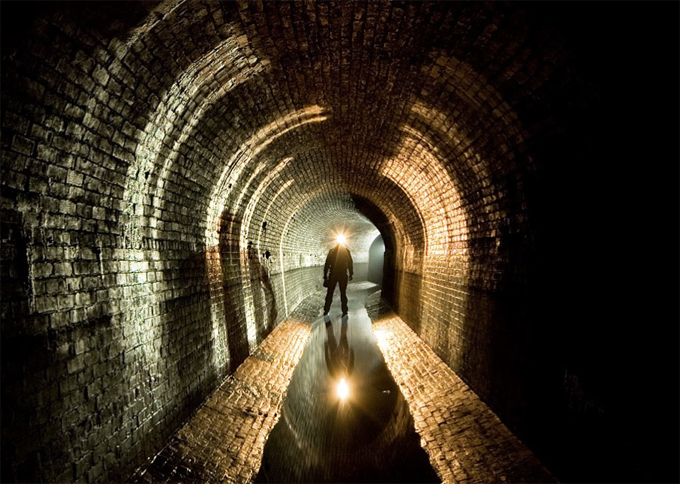 The popularity of urban exploration is on the rise and I suspect that many incredibly curious city-dwellers have been doing this sort of thing for a long time (I’m pretty certain Fagin knew all the good underground routes in London). Among contemporary urban explorers, 32-year-old Steve Duncan is one of the most notable. Duncan is not merely a thrill-seeker, but is deeply concerned with urban history and development (he’s currently working on his PhD in urban history at the University of California, Riverside) and preserving these urban sites he so cherishes. This past weekend I caught All Things Considered on NPR and was pleasantly surprised by a story about this hero of mine: ‘Into the Tunnels: Exploring the Underside of NYC‘. For this story, NPR’s Jacki Lyden and producer Brent Baughman join Duncan for [most of] a 25-mile excursion beneath New York City, wading through raw sewage, crawling among rats and cockroaches, jumping over third rails and evading police. Duncan, Lyden and Baughman are joined by world-famous Norwegian adventurer, explorer and author Erling Kagge (he’s climbed Everest, hiked to the South Pole, and became the first person to walk alone to the North Pole, just to name a few of his accomplishments). I strongly urge you to read the article and listen to the 20-minute broadcast if you have not already! Duncan was also recently joined for an adventure under NYC by HDSLR director/cinematographer Andrew Wonder, which is documented in this 30-minute video entitled ‘UNDERCITY’, which is definitely worth a view. Sorry for hijacking your blog but I went and investigated in my own backyard, found some interesting things and got my mind blown by one. Warsaw is naturally quite different from NYC, the subway was only built in the 90s so there’s nothing that special in that respect (the Soviets gave us a choice between building us a subway or the Palace of Culture as a symbol of Polish-Soviet friendship and we were stupid enough to choose a Palace of Culture, the exact same useless hideousness as you can find in all major soviet cities, and were stuck with no subway till the 90s). But there’s many miles of underground tunnels in Warsaw that come from long before that – the 18th and 19th century. And also an underground river that dried up in mid-19th century. Closest to where I live – underneath Prague there’s 2km of explored and more of unexplored tunnels shared by a steel and arms factory and an energy plant. They’ve been rebuilt several times and used for transporting goods and test shooting new and repaired firearms. There’s also a lot of industrial underground spaces. Multiple underground levels beneath the Warsaw Brewery. The water filtering hall from the 19th century that looks more like a temple than an industrial space – it’s made up of a dozen connected chambers with granite columns holding up a brick ceiling, all of this always glistening from the moisture. The oldest underground site in Warsaw is the Freemason Eliseum and the underground Gucin Park, built in the 70s of the 18th century by the last Polish king’s brother beneath his garden. The Gucin Park was built as a place to bury freemasons who had had a dispute with the Church. Now the corridors are flooded so it’s very dangerous to enter, I haven’t found any information on plans to rebuild it. Feel free to hijack any time!! considering that my comments on your blog are sure to get double the views my own blog gets in a week – I might, haha. Urban exploration, yeah! I wanna do more of that!